In summertime you can experience the midnight sun in Northern Norway. This means that you can actually see a bright shining sun in the sky, in the middle of the night. It's truly amazing. But the people living in these parts of Norway have to "pay the prize" in wintertime, because the sun will not rise above the horizon at all for at couple of months! There's some daylight anyway for a few hours, but for most of the day it's pretty dark. Really depressing you think? Not at all. All seasons has their highlights. In the dark wintertime you can often see fantastic Northern lights (Nordlys in Norwegian) or Aurora borealis, which is the scientific name. Some call it arctic lights. The lights are the result of large solar explosions that travel from the sun and reacts with the earth's atmosphere. So, what are the chances of seeing the Northern lights? You can get a reliable daily forecast from the University of Alaska Fairbanks. One of the more comfortable ways to experience the northern lights, is to book a cruise with Hurtigruten. Sailing from Bergen and northbound you are set to experience the beauty of the northern lights as you get further north. When you're on a ship sailing through the dark, the lights will appear more intense than if you're watching from an urban area. 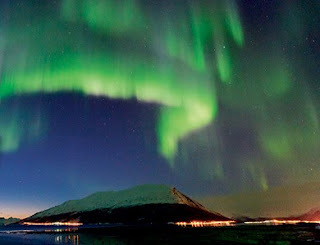 Read more about Hurtigruten and the northern lights. Written by Skipskatta time: 11:34 a.m.